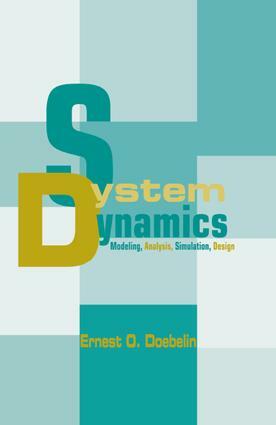 Addressing topics from system elements and simple first- and second-order systems to complex lumped- and distributed-parameter models of practical machines and processes, this work details the utility of systems dynamics for the analysis and design of mechanical, fluid, thermal and mixed engineering systems. It emphasizes digital simulation and integrates frequency-response methods throughout. ;College or university bookshops may order five or more copies at a special student price, available on request. System elements, mechanical; system elements, electrical; system elements, fluid and thermal; basic energy converters; solution methods for differential equations; first-order systems; second-order systems and mechanical vibration fundamentals; general linear systems dynamics; distributed-parameter models. Appendices: A-viscosity of silicone damping fluids; B-units and conversion factors; thermal system properties.